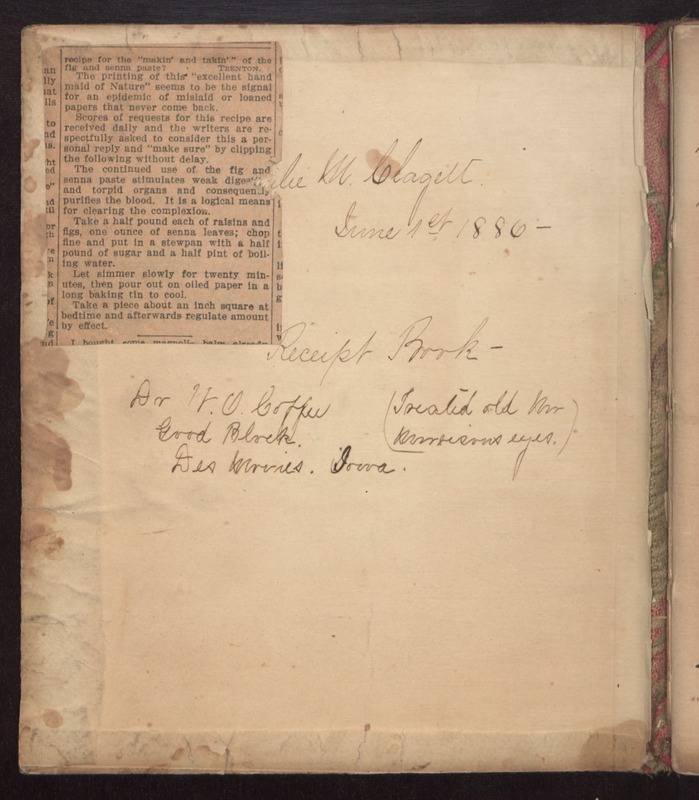 Julie M Claglett June 1st 1886- Receipt Book- Dv H. O. Coffee Good Block Des Moines, Iowa. (Treated old Mr Morrisons eyes.) recipe for the "makin' and takin'" of the fig and senna paste? TRENTON The printing of this "excellent hand maid of Nature" seems to be the signal for an epidemic of mislaid or loaned papers that never come back. Scores of requests for this recipe are received daily and the writers are respectfully asked to consider this a personal reply and "make sure" by clipping the following without delay. The continued use of the fig and senna paste stimulates weak digestion and torpid organs and consequently purifies the blood. It is a logical means for clearing complexion. Take a half pound each of raisins and figs, one ounce of senna leaves; chop fine and put in a stewpan with a half pound of sugar and a half pint of boiling water. Let simmer slowly for twenty minutes, then pour out onto oiled paper in a long baking tin to cool. Take a piece about an inch square at bedtime and afterwards regulate amount by effect.